➤ $10 Admission – Children 3 & under free! Monday – Thursday: 8am to 6pm | Weekday discounted ticket: $6, with the option to add-on a hay ride and jump pillow bracelet for $2 extra. Hay, Come Join The Fun! Jump Pillow – Purchase of $2 bracelet required to jump. Pumpkins – Prices range $3-$15 depending on size. Pumpkins are also available for purchase at our Country Store without admission. Snack & drink concessions and food vendors will be available periodically. Please call ahead to double-check food options or feel free to bring a picnic lunch or dinner! 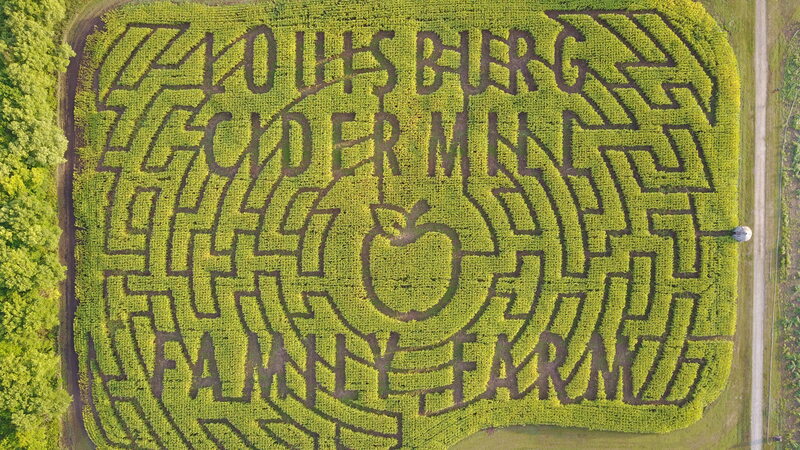 At Louisburg Cider Mill, each year we are known for our Fall Festivities. 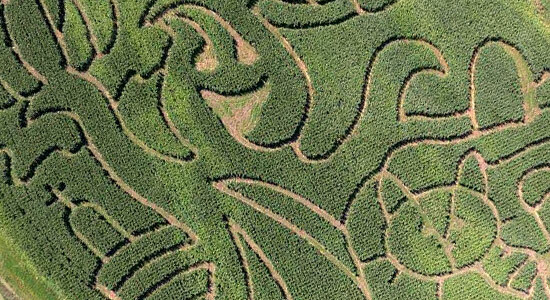 One of the most popular traditions is choosing an exciting new theme for our annual 10-acre Corn Maze. 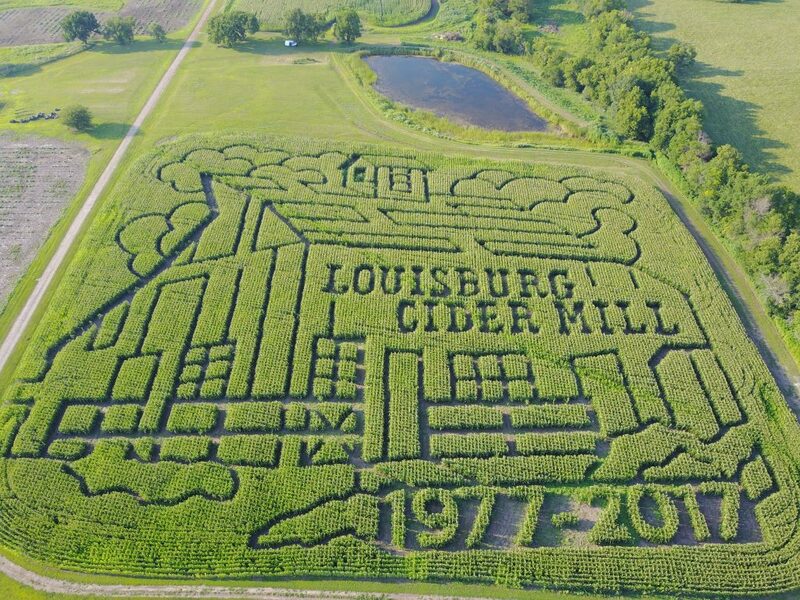 For our 2017 season, we celebrated our 40th year in business, so naturally we chose to highlight the Louisburg Cider Mill landmark red barn! 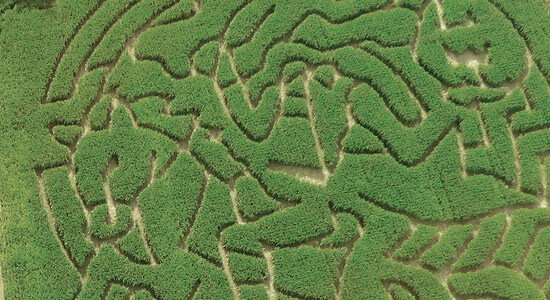 Our 2018 theme and maze design will be chosen late summer 2018… stay tuned! Check our Facebook & website often for special promotions & discounts! 9/14 – 9/16: Scout Weekend! As our way of saying “Thank You!” to all community service workers, all teachers, firefighters, enlisted military, first responders, EMTs, nurses and doctors will receive $2 off admission to the Corn Maze & Pumpkin Patch with a valid ID badge. 6:30 pm to 10 pm. Dress up for this fun night of spooks and thrills! Live music, bonfire, hayrides and more! Bring your flashlight to go through the maze in the dark! Zombie Forest is a fundraiser for our local Paola High School Robotics group. 10/19 – 10/21: College weekend!! College students receive $2 off admission when you show your student ID! 9th Annual Burning Scarecrow Event at 7:00 pm. Live music, bonfire, hayrides and more! Bring your flashlight to go through the maze in the dark! Zombie Forest continues!! Wear your costume for $2 off your ticket!! Saturday, October 27th: Cider & Spiders, Tricks & Treats! A fun-filled afternoon of trick or treating, kids music show, and a costume contest! Wear your costume for $2 off your ticket and some Halloween fun!! We’re located at 14730 K68 Highway, Louisburg, KS 66053 Twenty miles south of metro Kansas City via US Hwy. 69 to the Louisburg exit (Hwy. 68), then three miles west. As always, there is no admission for the Cider Mill & Country Store as well as viewing of the apple cider pressing. Q: What should I wear to the pumpkin patch & corn maze? A: It’s best to wear long pants and tennis shoes for your trip through the corn maze. Q: What should I bring to the pumpkin patch & corn maze? A: Water to stay hydrated. At night, a flashlight can be very helpful to get through the maze. Bug spray & sunblock also come in handy. Q: What is the goal of the maze? A: The object of the game is to find the letters hidden throughout the maze. Once you find all letters, try to unscramble them to spell a word that relates to this year’s corn maze theme. You may choose to enter your correct answer in a drawing for a special prize each week! Q: How long does it take to get through the maze? A: It varies. If you are an advanced maze navigator and don’t play the word scramble game it can be done in about 20 minutes. To find all of the letters in the word scramble it takes most navigators 30-45 minutes. Q:Is there food and drink for sale at the pumpkin patch and maze? 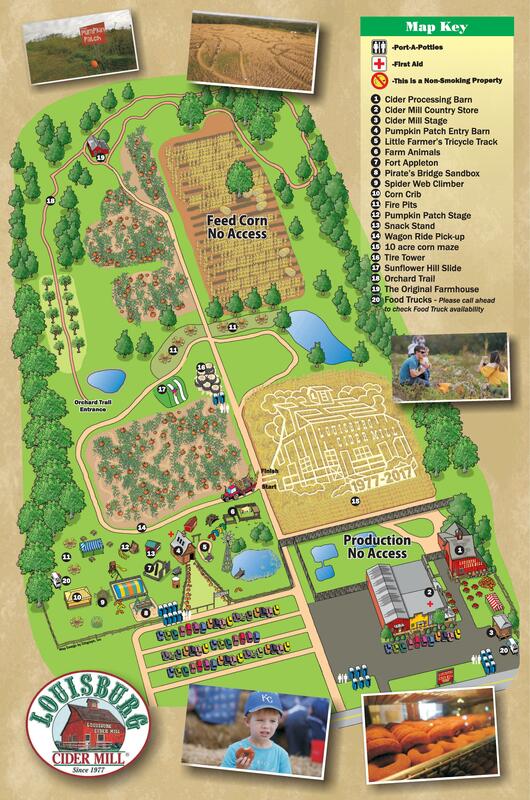 A: Yes, there is a concession stand with food and beverage options at the maze. Q: May we bring our own food and drink? A: Yes! You are welcome to bring your own food and drink. We have a large picnic area for your convenience. If you would like to roast marshmallows or hot dogs at the night time bonfire please bring your own utensils. A: We accept cash, credit, and debit cards. 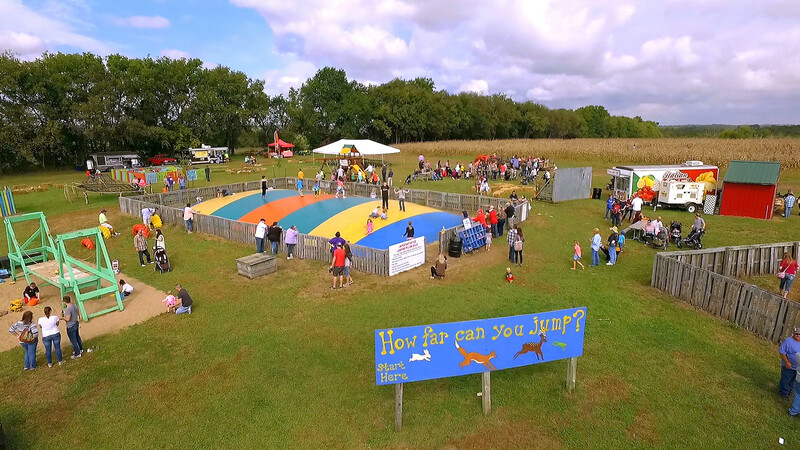 Q:Are dogs allowed at the pumpkin patch & maze? A: Yes, if they are on a leash and friendly. And please clean up after your pooch!